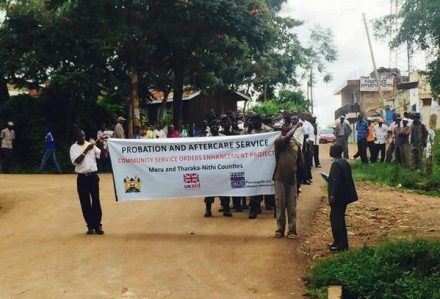 PRI’s ExTRA (Excellence in Training and Rehabilitation) project coordinator, Omar Khan, travelled to Meru, Kenya, last month where he took part in activities designed to inform the local community about the benefits of community service versus a prison sentence for minor offences and challenge common perceptions that community service orders are a ‘soft landing’. Consistently, one of the key stumbling blocks in achieving an increase in the number of Community Service Orders (CSOs) given by the courts as an alternative to short sentences, is that the local community doesn’t back the initiative. This can be seen in the results of the baseline research completed by the National Crime Research Centre (NCRC), Kenya, on behalf of PRI and the ExTRA Project. NCRC found that 63.6% of magistrates interviewed did not think that short sentences were a good way of dealing with petty offences, yet they continued to give out short-term custodial sentences. In fact, 93.9% of prisoners in the Meru region (4,526 of 4,819) were serving sentences of three years or below and therefore eligible for a CSO. The main reason cited by the magistrates for why they avoid CSOs was that they believed that the local community see these sentences as a ‘soft landing’. In order to combat this view and promote the many positive aspects of alternatives to imprisonment, PRI have been working with the Probation and Aftercare Service to engage the community through TV, radio and the press. There have also been Open Days in the target areas and I was fortunate enough to attend one in May. After initially being a little sceptical about the effectiveness of Open Days, I was completely converted after witnessing the enthusiasm and participation on the day. A number of Probation staff and members of the local government opened the day by explaining PRI’s ExTRA Project, which is funded by DFID, and spoke of the positives of community service to an audience of local people and school children. Members of local organisations that could provide advice and services around health and education also spoke and offered support. After some the initial speeches, there was a procession through the town, accompanied by a local brass band, to attract the attention of the local community to come and find out information about the project and learn about community service. What attracted even more attention was when some local magistrates and I followed the same route, picking up litter as we went. Many people initially laughed and pointed at us, but were soon nodding thoughtfully after a magistrate explained to them that we were demonstrating what could be achieved through community service and why it made sense to use this punishment rather than locking people away in unhealthy conditions, where they are unable to work and contribute to society. Some people assumed that I had been arrested for being drunk and disorderly (one of the most common crimes to receive the CSO sentence), but I assured them that I hadn’t had a single drop of Tusker. Whether they believed me or not, it seemed to help the attendance back at the Probation Office where more information was given out. Ex-offenders that were currently or previously involved in Community Service or Probation were invited to attend and speak about their personal experiences and to outline exactly what was involved. It also gave magistrates a rare opportunity to engage openly with the community and they took a number of questions from the audience about community service and various crimes. The day was marked by the planting of trees and hopefully some positives seeds have been sewn in the minds of Meru Town Community. PRI's research and recommendations on the use of alternatives to imprisonment in East Africa.